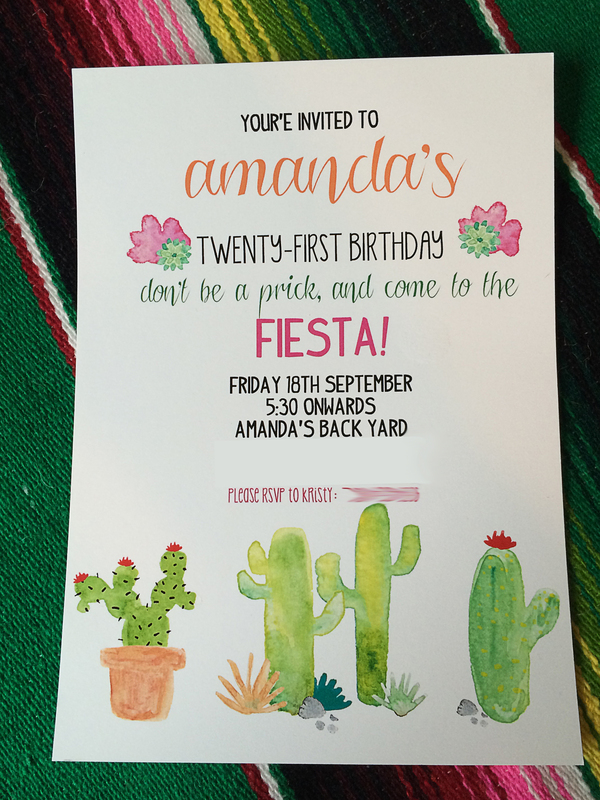 For my daughter’s 21st birthday we pinned and planned a fiesta-themed party. The weather had finally cooled down some and we were excited to have a party outside in the garden. We planned an eating area, as well as a fire pit section for later in the evening. The invitations set the tone with an adorable cactus/fiesta theme graphics from BellaLoveLetters on Etsy. The day before the party, I was very excited to find a store that had bittersweet available. It brings such a fall touch to arrangements. The flowers were mostly all from the garden with the exception of that and some celosia and another flower. I had this huge vase from Pottery Barn for years and was so excited to try it with real flowers in it. 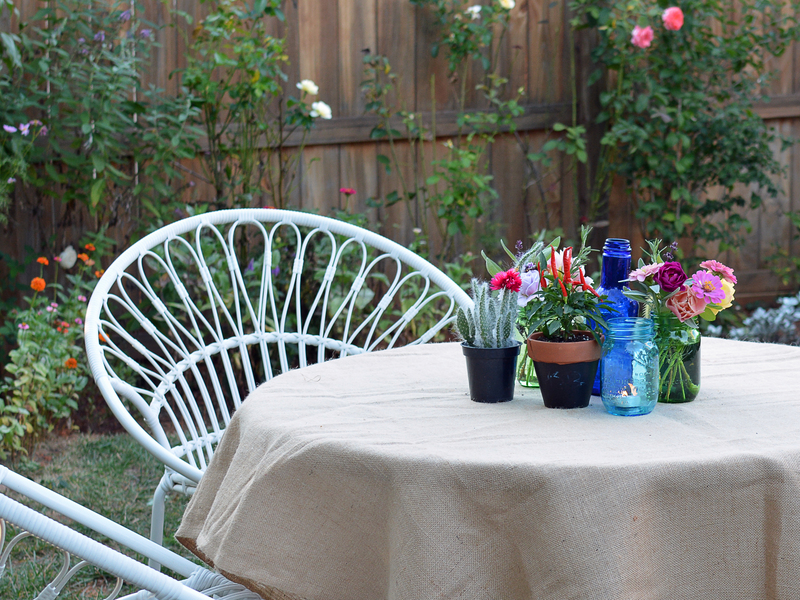 We brought our dining room table and patio table into the garden and draped all the tables with burlap. 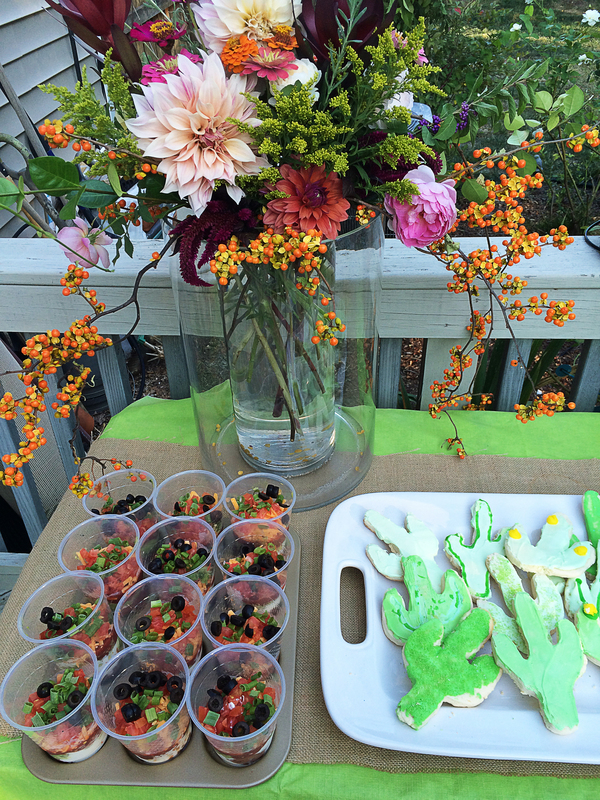 Each table had a grouping of cacti, decorative peppers, and various color mason jars and bottles. Serendipitously, the garden was also in bloom. The serape is from Lulu and Georgia. It comes in a few different colors. Its is such a fun accent for the tables. The bunting I designed for use in another photo shoot, but it seemed perfect for this gathering as well. 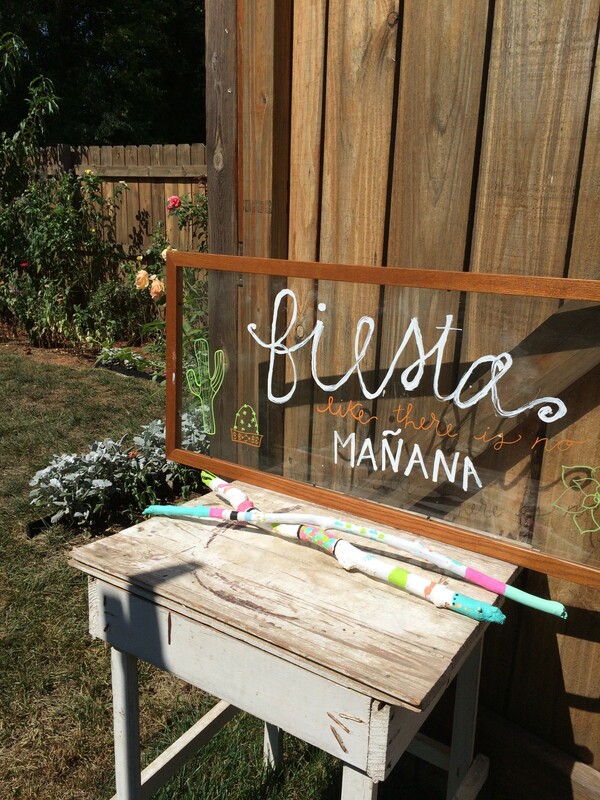 The guests were greeted at the gate to come in and “Fiesta like there is no manana” with this cute sign my daughter made, along with a few tribal sticks she had painted. We had such a fun time pinning and planning this party, from the decor to the various new recipes we tried out. The link to our pinterest board is here if you would like to see how pins we liked were worked into areas in the party. 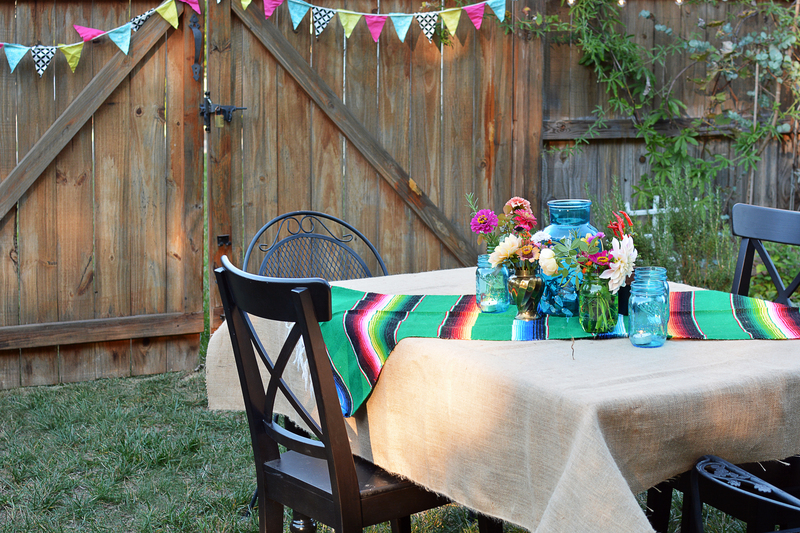 Its great for either a fiesta …or a cinco de mayo party. The recipes were did from Pinterest included the seven layer dips in individual cups, the mexican street corn casserole, the cactus cookies, the Smores casserole in a cast iron pan, and the Bailey’s soaked marshmellows. This handsome burro was from Target. These individual layer dips were a hit with the party goers. So much easier than hanging around the food table dipping or trying to scoop a portion onto a plate. We also found tiny marguerita cups at Party City and used those to hold guacamole or salsa. 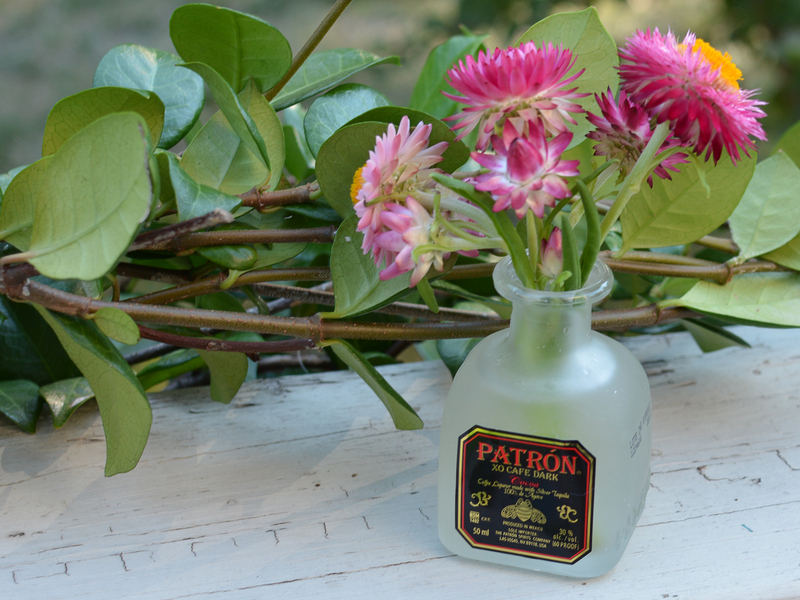 Individual tequila bottles make good vases. We also service Jalapeno and Watermelon Margueritas for the over 21 crowd. A fun sombrero for photo ops which was off amazon. A cactus cookie cutter from Amazon was used for the cookies. They sell two sizes. This is the larger size and I think I would recommend the smaller version as this size was a bit tough to keep all the cactus limbs intact. 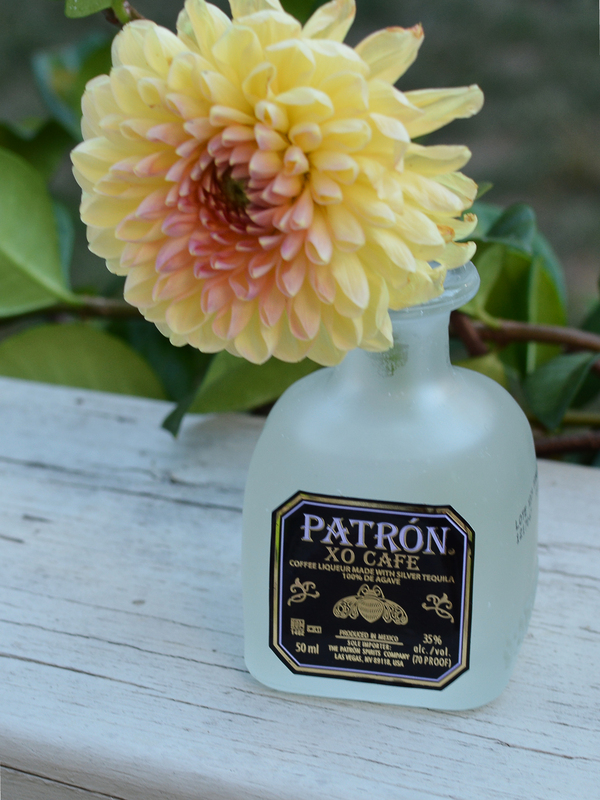 I hope you have enjoyed our Fiesta/Cinco De Mayo themed garden party. Take a minute and go over to our pinboard for this event. There is definitely a certain sense of satisfaction in seeing one of your pinboards come to life and trying some of the crafts and recipes.